15.7.1897: Launched by Edwards Bros, North Shields (Yd.No.556) for Kelsall Brothers & Beeching Ltd, Manchester as JAY. 13.10.1897: Registered at Fleetwood (FD178). 13.10.1897: John E. A. Kelsall & George Beeching, Fleetwood appointed managers. 13.4.1899: Registered at Hull (H278). 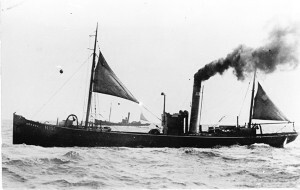 15.7.1913: Hull registry closed and vessel registered anew in consequence of material alterations (H278). 15.7.1913: Re-measured after lengthening to 119.0 ft 166g 64n. 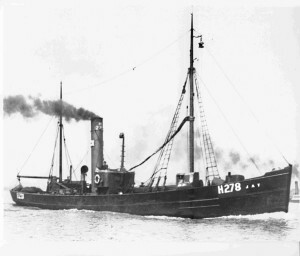 10.1914: Requisitioned for war service as a minesweeper (1-6pdr HA) (Ad.No.375). 11.8.1917: Returning to Gt. Yarmouth, torpedoed by U-boat (UB35) 500yds NE of “C” Buoy in position 55°19N/1°49E; nine crew lost*, three (two? )crew and dog saved+. 27.12.1917: Hull registry closed “Total loss”. 27/01/2009: Page published. 3 updates since then. 13/09/2017: Removed FMHT watermark from image. 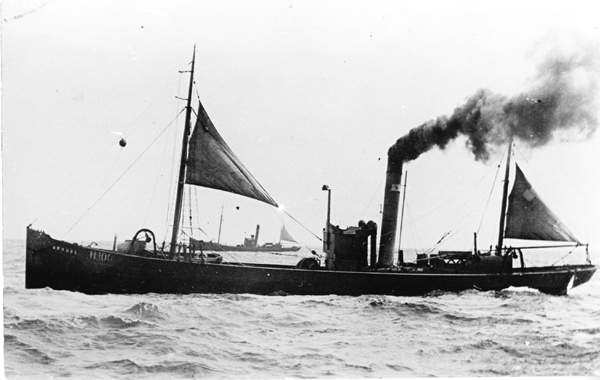 This entry was posted in Lost Vessels, Steam Trawlers, Steamers (Picture), War Losses and tagged Kelsall Bros & Beeching Ltd, Lost, War Loss on January 27, 2009 by Fred Smith.